Let's start with stating that it's so much fun defending myself against a whole County. But, you know me: BRING IT! 1) The D1 Commissioner's office takes it upon itself to provide a free service to the rupester that is not available to everyone else in the District: forwarding e-mails that mention her by name. 2) The mid-level IT employee calls me a liar and is joined in the effort by his supervisor. Sweet! All's fair in County business. 3) That it is one thing to conduct an investigation from outside of a department, but the fox asking the hens questions inside the hen house is just as fun. What kind of response was to be expected except that the immediate supervisor was right? He did nothing wrong! Their jobs depend upon it. Get real. 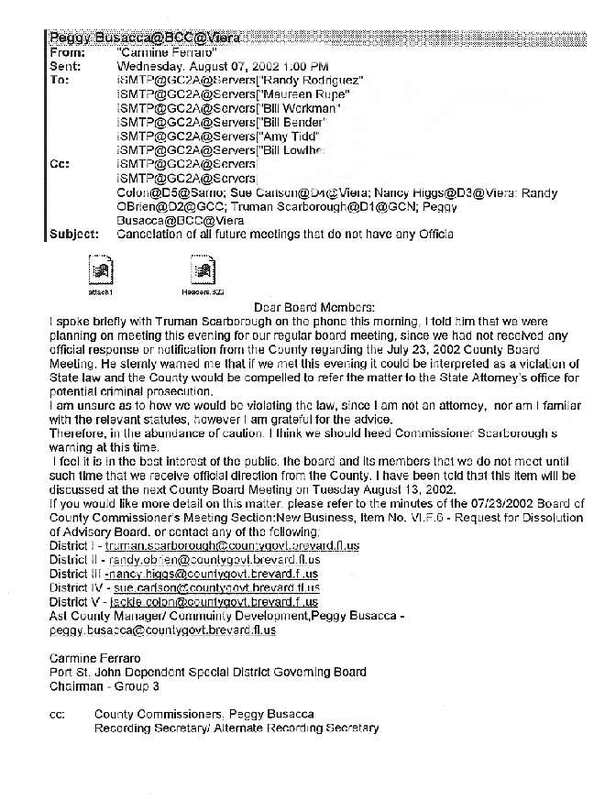 a) The PSJ Advisory Board of 2001 conducting business in support of PSJ4T's incorporation push, meeting without cause, failure to keep Sunshine Laws, etc. They faced potential criminal prosecution http://www.spacecoastconservative.com/images/cfemai1.jpg and I exposed that. The Board should have been disbanded, but they were allowed to stand. No surprise. b) D1's office refusing to obey the Sunshine Law previously regarding a rupester list that she hand delivered twenty-one hours prior to my FL SS 119 request for any lists or names of people who had expressed an interest in being considered for appointment to the PSJ Advisory Board received in the D1 office on Feb. 24, 2005 and I asked for a copy of that list Feb. 25, 2005 but did not receive it until after informing the Brechner Institute and then-State Attorney General, Charlie Crist, of the breach. I was still doing e-mail battle with Scott Knox on March 10, 2005. Even a member of that Board at that time, Martin McClellan, was having difficulties getting the same list of names -- even after a FL SS 119 request to D1 -- as of March 11, 2005. The employees of D1 were never punished for such blatant disregard for Citizen Requests and the Sunshine Law and apparently the same attitude is currently being fostered and approved. No surprise. It's Brevard County. c) I have dealt with other things going on within the County in the last ten years, and even more in the sporadic activities of the past thirty-one years (homeschooling will make political activity sporadic). I have been active in fighting the one cent sales tax, the PSJ incorporation effort, the Mims incorporation effort (on invitation of some Mims residents) and against a few local candidates. I have yet to be proven a liar in any of the battles I have fought and most of my efforts are still available on my website. Check it out and see if you can find a lie on my website. Look for one. d) I do not -- now or ever -- have to lie to win the battle. If I lie I lose credibility, I lose support, I lose readers, I lose friends and website followers and I lose my self-respect. I do not lie because it is a sin and it is a black hole on my soul. Now, if you'll do me the kindness of looking at Mr. Sellers' e-mail and finding my response (in red) to each of his points (I'll call them points), I will proceed to respond to the specifics. Because we always take any disrespect shown to citizens of Brevard County very seriously, Rick asked me to launch an investigation of the incident since I am his immediate supervisor. Fox / hen house. For the investigation, I read the initial email exchange between Mr. Meshberger and Ms. McKinney, I read the web page Ms. McKinney noted above, and I interviewed Rick and the three co-workers Ms. McKinney mentions. I did not attempt to contact Ms. McKinney as she has documented the discussion as she recalls it at the website in her email above. Convenient. Do not ask the only dissenting voice, the only prosecution witness. The only one who has no reason to lie. How else can the deck be stacked? NOTICE THE WORD: "EXTENSIVE" in there? Yeah. Read the "NOTE" at the bottom. "I do not ask that you search ALL mailboxes. I ask that you search three: FISHER first. This way if you find it in the first search, you don't have to do the other two. Then I ask that you search BOLIN and NELSON in that order. I have reduced the request to the hours between 7 PM Sep. 7th and NOON Sep. 8th. I ask that you first search the hours between 8 AM and NOON Sep. 8th because that's when I suspect FISHER sent my e-mail to Rupe. Given these parameters, I see no way for you to estimate a "time certain" as to how long it will take to do a search for my GUARANTEED UNDER FL SS 119 information. IF after the search done under my direction you can prove that an employee actually took even half an hour to complete the task -- actually working on it, and not just having it run in the background while they are doing something else -- then you may figure a bill for me at that time. Please send the bill to Maureen Rupe at 7185 Bright Ave. Port St. John, FL 32927. She received $595.50 worth of PRINTED RECORDS FREE OF CHARGE Sep. 29, 2009 and I'm sure she'd be happy to pay her fair share for someone who wants one little bitty e-mail forwarded. If she is unwilling to pay, then I am sure that the County would like to treat us all fairly and I request that this bill be applied to the same $595.50 worth of FREE RECORDS I should receive that Rupe received in 2009. Just to be clear, I do NOT request a PRINTED version, I can print it myself. Just FORWARD THE E-MAIL sent from the Commissioner TO Rupe during that time frame. I'm sure that would be a cheap thing for her to pay." We went into the IT department and into an area with three people -- two men and a woman (Glenda; very nice) -- working on computers. Rick told Glenda that I wanted to look at some e-mails. She started bringing the e-mail program up and asked which ones I wanted. I said I'd start with D1 and wanted September 7th and 8th, between 7 p.m. on the 7th, and noon on the 8th. I said to the man who brought me in, "You must be Rick Meshberger." He said that he was and asked, "And you are...?" I said, "Me." He said, "Me? Just me? You're not going to tell me who you are?" I said, "No." You could see the wheels turning and he said, "Oh, I know who you are." I said, "You're a smart man, I knew you'd figure it out." Imagine my surprise when his next words were, "You're a liar." Yes, Mr. Rick Meshberger called me a liar after my telling him he was a smart man. Not the best timing in the world, agree? I said, "I'm a liar?" He said, "Yes. You are." I said, "Nice. You call me a liar in front of your employees. About what did I lie?" Mr. Rick Meshberger then said, "Because you didn't put my e-mails on your website." Not posting something is lying, in Mr. Rick Meshberger's book? Hmmm... Okay. Rick: “You only spoke a half-truth on your web site.” Meshberger never spoke these words. Rick: “No, I’m saying you spoke a half truth on your website. Nor these. You didn’t include my responses to your email.” Nor these. I interviewed the three co-workers in the room at the time. All three stated that they were busy and weren’t paying close attention to the exchange. As is common in these situations, each had a slightly different remembrance of the exchange. If they're not paying attention, they're not very accurate witnesses and those who were paying attention's record should be held as higher authority and with greater accuracy than those who admit they were not paying attention. Though none of the three remember the conversation going exactly as described by Mr. Meshberger or Ms. McKinney, they all said that Ms. McKinney is the only one who used the word “liar”, Can you imagine working in the IT Dept. and NOT agreeing with your immediate supervisor in this situation? and all three remember the exchange being closer to Mr. Meshberger’s version than Ms. McKinney’s. Again, they were not paying attention at their own admission. In a court of law they would not stand up under cross examination and I have not been given that privilege. "We, the people of the State of Florida, being grateful to Almighty God for our constitutional liberty, in order to secure its benefits, perfect our government, insure domestic tranquility, maintain public order, and guarantee equal civil and political rights to all, do ordain and establish this constitution. "SECTION 1. -- Political power.- All political power is inherent in the people. The enunciation herein of certain rights shall not be construed to deny or impair others retained by the people. "SECTION 2. -- Basic rights.- All natural persons, female and male alike, are equal before the law and have inalienable rights, among which are the right to enjoy and defend life and liberty, to pursue happiness, to be rewarded for industry, and to acquire, possess and protect property; except that the ownership, inheritance, disposition and possession of real property by aliens ineligible for citizenship may be regulated or prohibited by law. No person shall be deprived of any right because of race, religion, national origin, or physical disability. Where does it say anything in there that could be considered a LIE? Where is a lie TO, ABOUT, AGAINST, FOR, PRAISING, CONDEMNING, OR ANYTHING OR OTHERWISE AFFECTING MR. RICK MESHBERGER? Why would he consider that a "half-truth" (in his alleged words)? Where is a lie? What made him take offense at that? Where is it that I did ANYTHING AGAINST THE MAN? Yet, he chose to take offense at the fact that he was mentioned as in he just happened to be the person I was dealing with at the IT Dept. If it had been Pinocchio, his name would have been at the top of the e-mail. As you can see, the reason I posted the e-mail is because I thought it was funny. It was NOT to be an afront against Mr. Rick Meshberger. HE CHOSE TO TAKE OFFENSE. He CHOSE to take offense to such an extent that he called me a liar in front of three of his employees. READ the rest of the blurgs of September. Is he mentioned anywhere? Why -- if he was oh, so innocent -- would Mr. Rick Meshberger choose to mention my website at all if he had not CHOSEN to be offended by it? Why would he even mention that I did not put his e-mails on there and that makes the Sep. 16 blurb a lie? WHERE IS THE LIE? The fact that I had to go to the IT Dept. to receive the e-mail nineteen days AFTER my initial request proves that I was having difficulties getting the e-mail. No one was willing to forward ONE STINKING LITTLE E-MAIL THAT -- IF THE INITIAL REQUEST HAD BEEN HONORED AS LEGALLY IT SHOULD HAVE BEEN -- WOULD HAVE NEGATED ALL THIS FUSS IN THE FIRST PLACE. D1 screwed up on this one. They screwed up badly trying to protect themselves. All I did was mention the fact that I had not received the e-mail yet. Libel/Slander is a serious matter. When Mr. Rick Meshberger called me a "LIAR" he chose to open himself up to disciplinary action. I did not libel/slander him by lying about HIS CHOICE OF WORDS. ALL of this was HIS CHOICE. Given the above, I do not believe the major offense of disrespecting a citizen was committed in this situation How convenient and of course you don't., and would strongly recommend against disciplinary action. Shock. Suprise. I'm fainting in astonishment. I will personally review the appropriateness of each of Rick’s actions in this situation with him and anticipate better outcomes in the future. Don't hold your breath. When it's condoned like this, it procreates and multiplies like bad habits. Brevard County has a horrible reputation and it brought the reputation upon itself via actions such as this. NOTE: I notice that neither Mr. Rick Meshberger nor Mr. Sellers denied the fact that a search engine was used and made the effort to find my e-mail a five minute effort on Glenda's part. Now, why was the first estimate so much larger than five minutes and why was the second estimate -- after I had narrowed the search parameters -- so much larger than five minutes and why was the third estimate still an additional twenty-five minutes? Are we being milked for money via "extensive use" of personnel and equipment laws? That search engine Glenda used made finding my request very fast. Why was my e-mail not delivered sooner considering the availability of that search engine? If I'm lying about how things happened at the department, I suppose I'm lying about the search engine and how quickly it found the requested e-mail as well? As I said in a previous e-mail, "I will not be bamboozled." BY THE WAY, This e-mail will be posted in its entirety on my website. All correspondence becomes the legal possession of the receiver. That's the law. Thanks for the proof, Mr. Sellers. Information Technology Director Not surprised. Brevard County Board of County Commissioners Taxpayer and abused employer. Since you work for me and I pay your wages (the same for those under you), I see no need to pay extra for work that I am asking you to do for the fist time in months. As to forwarding my e-mail to the USELESS County Attorney's office, Hoorah for you! Feel better? Now, at my direction, do NOT do the search. I shall find another way to get the information and I shall get it without your idiocy and assistance. Grow up. As I have stated the amount of time necessary to compile with your request could take as much as 1 hour to complete. Obviously if we do the search and find the email you’re looking for right away as you suggested then you will not be charged if the amount of work takes less than 30 minutes. But since you have not giving me authorization to proceed then I am forward your email below to the County Attorney’s office for their direction. I do not ask that you search ALL mailboxes. I ask that you search three: FISHER first. This way if you find it in the first search, you don't have to do the other two. Then I ask that you search BOLIN and NELSON in that order. I have reduced the request to the hours between 7 PM Sep. 7th and NOON Sep. 8th. I ask that you first search the hours between 8 AM and NOON Sep. 8th because that's when I suspect FISHER sent my e-mail to Rupe. Given these parameters, I see no way for you to estimate a "time certain" as to how long it will take to do a search for my GUARANTEED UNDER FL SS 119 information. IF after the search done under my direction you can prove that an employee actually took even half an hour to complete the task -- actually working on it, and not just having it run in the background while they are doing something else -- then you may figure a bill for me at that time. Please send the bill to Maureen Rupe at 7185 Bright Ave. Port St. John, FL 32927. She received $595.50 worth of PRINTED RECORDS FREE OF CHARGE Sep. 29, 2009 and I'm sure she'd be happy to pay her fair share for someone who wants one little bitty e-mail forwarded. If she is unwilling to pay, then I am sure that the County would like to treat us all fairly and I request that this bill be applied to the same $595.50 worth of FREE RECORDS I should receive that Rupe received in 2009. Just to be clear, I do NOT request a PRINTED version, I can print it myself. Just FORWARD THE E-MAIL sent from the Commissioner TO Rupe during that time frame. I'm sure that would be a cheap thing for her to pay. Thank you for response. By narrowing down the time like you did should reduce our search down to approximately 1 hour. Doing a search of all mailboxes is not as simple as you described. My employee has to search each mailbox separately, compile any results, go on to the next until all mailboxes have been searched. He/she must then go through each and every email to make sure it is deemed public record and to redact any private information such as SSN and so on. I am just trying to do my job and do not have any motive whether you get this information or not. It does not matter to me. But according to the County’s Administrative Order (AO-47) any request requiring more than 30 minutes is chargeable. Based on the 1 hour of estimated time that it will take to process this request I need your authorization to proceed. If so, what format of output is desired. We can print the results, create a PST (Outlook file) and write it to a CD or create an image of the email and write that to CD. I'll further specify my time frame: BETWEEN Sept. 7th at 7:00 P.M. and Sept. 8th at 12:00 NOON, FROM FISHER, Bolin, Nelson, Anderson TO MAUREEN RUPE. That should really narrow it down for you. I remind you that FL SS 119 states: "If the nature or volume of public records requested to be inspected or copied pursuant to this subsection is such as to require extensive use of information technology resources or extensive clerical or supervisory assistance by personnel of the agency involved, or both, the agency may charge, in addition to the actual cost of duplication, a special service charge..." I doubt that this request is now considered "extensive" since I narrowed the search to four people and seventeen hours.Since Fisher's office was closed Wednesday (Sept. 7th) after 5:00 p.m. and unless he sent the e-mail to Rupe via his cell phone or other portable electronic device, I suggest you focus your search on Sept. 8th in the hours between open of business (about 8:00 a.m.?) to the time of her reply received by all five of the Commissioners at 11:52 a.m. Setting these search parameters on a computer and leaving for coffee is neither extensive use of IT, nor is it extensive clerical or supervisory assistance. I have been a fluent computer user since before Windows 3.1 -- DOS is my first language -- so I know what I am talking about. I know my rights, Sir. I shall not be bamboozled. 119.07 3. (d) If the nature or volume of public records requested to be inspected or copied pursuant to this subsection is such as to require extensive use of information technology resources or extensive clerical or supervisory assistance by personnel of the agency involved, or both, the agency may charge, in addition to the actual cost of duplication, a special service charge, which shall be reasonable and shall be based on the cost incurred for such extensive use of information technology resources or the labor cost of the personnel providing the service that is actually incurred by the agency or attributable to the agency for the clerical and supervisory assistance required, or both. I just wanted to let you know that your public records request is on hold until I get authorization to proceed. See my email below. You submitted a public records request on 9/12/2011 and was forwarded to the IT department to fulfill. It is estimated that this search and compilation will take approximately 3 hours to perform. The charges for this work will be based on the lowest paid employee capable of doing the work which is $21.75 per hour. Again, 3 hours is only an estimate but I need your authorization to proceed.